We realize project management test can be important test to pass, especially when trying to get professional job in corporate world. There are many different exams that Project Managers consider when embarking on the journey of becoming manager or director. Our company specializes in preparing students who are in college or undergraduate level or even graduate level in preparing them for Project Management exam. Visit our IT Managed services section to view how real company offers real solutions for enterprise level businesses. Many principals of project management are tied into concept of service model and directly into ITIL certification test. Studying for PMP exam and passing is only breaking the tip of the iceburg, real fun begins when you master ITIL exam, followed by AGILE, SCRUM and if you really got what it takes Black Belt Sigma. Many companies need project managers, who are masters in organizing information. Our company DBA Binary Fusion, operated as it's own individual company under umbrella of Tutoring Services, LLC in fact specializes IT infrastructure, Network, Security and Network Consulting, with core emphasis on IT consulting and Project Management. Many services that we provide are directly tied into project management, ITIL, Problem management, incident management, IT policy development and many other aspects of information technology field. Passing PMP exam and becoming Project Management expert with specialization in information technology is one of the hot leading fields out there, many companies are searching for such PMP experts with specialization with some level of technical skill set. Our company helps students become PMP certified and even offers internships, working on Information Technology IT projects, and obtaining that level of specialization employers are looking for. However PMP exam is not easy to pass, especially if you have wrong training information material. Best way to prepare for exam is to study from official PMI course. Make sure that you end up studying for appropriate exam, when preparing for your certification test, other exams you may consider preparing for to improve your qualification is Agile, SCRUM, ITIL, SIGMA, Microsoft Project. Our company Tutoring Services, LLC specifically works with college level and graduate students helping them prepare for PMP, Agile, SCRUM, ITIL, SIGMA exam and even offers internship opportunities for subject matter experts with Infrastructure IT Network technical level of specialization. In simple words, we help students prepare for exam, we do that by helping them get matched with proper subject matter experts in CT NY or NJ. For our PMP Project Manageer subject matter experts in Fairfield County visit this page. If you are trying to find PMP subject matter experts or study guides that can help you prepare for PMP exam you came to the right place. In here you will find collection of PMP study guides in the form of flash, cards exam secrets, official PMI training materials, and local Westchester County Tutors in the area. Simply scroll below to view study guides of your choice, be sure to visit any of them to view details and compare prices. If you are looking for other subjects study guides then don't hesitate to visit this page, for list of all other subjects test prep materials. View other Project Management study guides here. Trying to study for your PMP exam? Have you consider studying wtih online resource that has 5 mock tests, and qualifies you for 35 hours of PMI requirement? If you are interested in getting certified in PMP, then look no further then the study resource shown below. We also happen to have discount coupons, if interested simply visit our google plus page and let us know that you are looking for PMP discounts and we can let you know if we have a coupon for your PMP study guide. Study for this exam with the help of a video course! If you are in the process of preparing for your exam there are tons of materials to study from, trouble is, there is so many of them! This course makes concept of project management exam easy to understand. For the most optimum learning effectiviness consider reviewing for your PMP exam from multiple study resources. Review the rest of the course below, or click buy now link for more info, or alternatively browse other study guide resources that can help you study for your exam. Rome Wells PMP Study Tip. For better results consider studying with both flash cards and exam secrets and the PMP tutor (either online or local). Combine studying from multiple study resources with the local or online PMP Test Prep Tutor for the best results. Continue reading to see which other resources. Therefore your other option is to enroll into a live PMP online course where multiple students take the course such as PMP Online training course by Edureka. There are multiple blogs out there on the market helping students prepare for PMP exam, and many of them tell you why PMP cert is important for individual success and prosperity. Some of the blog sties you find on the internet will provide unique content to help PMP aspirants prepare for their certfiication exam with ease and short time. Problem is with so many of the PMP study resources on the market it's hard to find organized, put together material that clearly walks you through your test prep journey, educates you with magic formulas to solve multi-choice questions, shows you unique 8 step approach, handles you to complete your exam in 2.5 hours, and helps you analyze your strong points, weak links and how to deal with them. However resource listed here is precisely that. According to the author of PMP exam this is a holy grail of how to pass PMP exam rather then a guide. Many test prep resources you find on the internet do provide value, but lack single source, single location that covers holy grail method of how to pass your pmp exam, having you navigate to multple sites, reading multiple peaces of information, leaving readers only confused at the end of the day. This particular PMP Study resource you find here called outwitting your PMP exam, is indeed combination of variety of blog sites neatly, put together into a single study resource, saving you tons of time from reading all the other test prep PMP nfo on the market that exists out there. Our Recommendation is to include this study materials as part of your PMP test preparation study path, and factor in many of the details, tricks, and 50 sure shot type of questions in the exam that you may encounter. Plus the kewl part about this resource is that it shares access to links to over 5000+ questions, that fact alone makes this study resource worth the money. Of course your other option is to search throughout the internet and find these resources on your own, but even our company Tutoring Services, LLC had hard time finding links to FREE PMP questions. That alone should be a huge plus, just remember though anything that is FREE you should trust but verify. What does this resources exactly over to PMP exam takers? Based on our understanding it offers many key-points that PMP test taker should know in order to maximize their chances of preparing for PMP test. It's equivalent to literally going out to the internet and searching for 100 of blog sites and putting infrom multiple sites into one site so it's all neatly available for you. Doing so on your own using FREE approach is also feasbile, however in our opinion it's just so much easier to pay small fee and get access to all of this info, plus the author of this PMP resource gives whooping 75% discount, if you share a link on linked in making it even cheaper for you to purchase. So in short  is it worth it to make it part of your PMP study path? Our answer is Yes: it's definitely worth it, plus it's chump change compared to other resources on the market. So in short this holy grail PMP guide can shorten amount of time you study and help you outsmart PMP test, but under no circumstances would we recommend simply studying from that resources on it's own. We do encourage future PMP test takers to review the material presented on this rather interesting cheat sheet holy grail method towards preparing for PMP exam, and make informative decision on your own. Feel free to continue reading details of this course below and be sure to consider including this resource into your study path. For better results consider studying with outwitting PMP exam resource (described further down below), & flash cards & exam secrets. Therefore your other option is to enroll into a live PMP online course where multiple students take the course online. You will obviously not get 1 on 1 individualized attention and higher quality learning effectiviness as much as let's say with the 1 on 1 online or local PMP tutor (as shown in this link), but taking online PMP course is a lot more affordable vs hiring 1 on 1 tutor, but obviously not as affordable as studying with only flash cards and exam secrets, and the study resource described on this page. If you are in the process of preparing for PMP certification exam and looking for affordable PMP course that won't break your bank. Then PMP course by Joseph Phillips can be perfect solution. This course is quiet affordable in comparison to other PMP courses plus it's offered by an actual PMI Registered Education Provider. In simple words what that means is, this course is high quality  Many other courses that you find out there are not PMI Registered Education Providers (REP), which means the quality of the course is not reviewed by PMI. What is the purpose of this PMP Course? This course will help you prepare for your exam with confidence, however do read our additional recommendations to see how to chose the right study path to maximize your chances of passing your PMP exam. Quality of the course is important just to become PMI REP, company must undergo rigorous processes of proving how their course can help students prepare for PMP exam, and must have great level of maturity. Plus the fact that you can get 36.50 PDU (professional development unit) is another great reason to take this course. PDUs are needed to maintaing your Project Management Professional status. This course is easy to follow and has interactive videos, which means you don't just watch a video statically, like it is the case with many other providers who offer PMP training, but instead you interact within some the videos as you watch the course, this helps you reinforce you project management content knowledge understanding. The fact that this course comes with 400 PMP Practice exam questions and answers on all eaxm objectives is a huge plus, you can practice your project management exam skills and see how well you do, then focus on the weak areas that you did not do so well on and reinforce these weak links with flash cards for every term used, PMP exam formulas and many other resources. How does this PMP course compare to others on the market in terms of affordability? One great thing about this course is that it's very affordable, and great study resource for PMP students on the budget. We (Tutoring Services, LLC) give this course 5 star rating for this course from the perspective of affordability. However it is worth to note that although this course offers many study materials, it has one of the lowest price, when you start looking further under the hood of why that is, main reason for that is because author of the course simply wanted to win by volume. This course use to be $199 Value now it's priced at $40! Other courses have higher price and do not have the same number of students signed up simply because what other providers offer is PMP course that are way too expensive. This particular author took a gamble to produce high quality but at very low price, and thereby managed to get high volume of students taking it and using it to pass. Over 9000 students are registered for this course this must tell you something right? Word of advice, although studying from a single course to prepare for your PMP exam maybe tempting, we urge you not to make this mistake and use from multiple study courses. If you are on the budget and can't afford any other courses then this PMP video course is for you, but even if you are on the budget do not risk failing your exam simply because you only relied on one study course provider to prepare for your exam. There are multiple study paths when trying to prepare for this test, depending on your budget. Studying for PMP does not have to be hard. 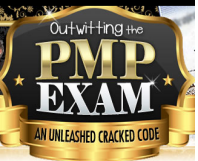 This goes without saying PMBOK is basically like a bible in PMP test taking community and is a must read before following any of the recommended study paths. Price of the PMBOK is exluded from our recommended study path plans suggested here. Chose this study path, if you plan to spend no more then $100 on your PMP preparation studies before taking your certification exam. Step 1. Study from Rita's book (simply because it's highly recognized in the PMP test taking community and based on our research this book is a must read for any aspiring PMP certification test takers. Step 2. Purchase access to this course that is described here, however before you purchase it please read reviews/recommendations for this course that our company Tutoring Services, LLC provides and  read about study paths you can take to prepare for this certification exam on this very same page. Outcome of this study path 1 will be as follows, you will have medium chance of passing your PMP certification exam, depending on your overall foundation level of Project Management content knowledge area. Chose this path if you want to maximize your chance from high possibility of passing your exam. Step 2. Purchase access to entire bank of PMP questions, great vendor who offers PMP practice exam questions and is also PMI recognized (REP) can be found here. Note these questions will give you high confidence for passing your PMP Exam and plenty of practice questions, having reviewed only practice questions from the course that we describe here is not enough on your own. Reinforcing your key knowledge areas with additional set of practice questions, provided by another vendor other then what you see on this course, is our recommended action for students who are in the process of preparing for their PMP studies. The reason we recommend these questions is because they are not just .PDF based, they are LMS system track based plus there are so many of them for you to study from that it simply makes most sense to use in addition to studying from this PMP prep test course that is described here. Studying from multiple vendors who offer high quality training is the key. Step 3. Definitely in addition to the questions recommended above purchase this course that we describe here, you can find out more about this PMP course and read other student' reviews by following this link. If you read abouth 2 recommended study paths above, and do not think that the recommended study path above is right for your need or perhaps not care about affordability much and simply want to prepare for PMP  exam with the most reputable study vendor on the market for PMP test then continue reading this 3rd study option. Overall study path 3  is a bit more expensive then then the study path 1 or 2, but it is still quiet affordable and does increase your chances of passing your PMP exam. If affordability is not an issue and your company is willing to pay for your course, then don't hesitate to check out this PMP self guided boot camp that is offered by another reputable training provider, that also have tons of PMP reinforcement knowledge lessons and cost a lot for a reason. That reason is, it's very high quality training and has tons of information that you would need to pass your exam. So what does Study Path 3 has? Note how study path 3 does not mention preparation from Joseph Phillips course? Why is it the case? Well although Phillips PMP course is cheaper indeed and a great course that covers many details, the course still does not have enough of study materials in comparison to what you would get with the self guided bootcamp. Plus if worth comes to worth and bootcamp does not do the trick of helping you pass your exam, you would get money back gurantee and can even sign up for online class directly with the same bootcamp vendor to reinforce your study skills even more for seperate online class fee, offered by the same vendor. Plus bootcamp simply has way more content then what is offered in Phillips course therefore price is much higher. For example, if you were to go with the self guided bootcamp for your PMP studies you would have tons and tons of access to the practice questions for 90 days, be able to create your own questions and drills, have access to to power point slides, process maps, and many other key characteristics that Phillips course does not have. Bootcamp covers many PMP study materials that are already included, so this way you would not have to buy additional study materials seperately. The only thing you go to watch for is 90 days access, be sure to ensure that 90 days is enough for yourself. If you chose to go with study path number 3. If you think it's not enough time, then before enrolling into the online self guided bootcamp, do go thorugh this Joseph's PMP prep course as your first step, so this way you are not going to be too stressed out going through the bootcamp content. This is a great PMP course to help you prepare for the PMP exam. Make sure that you allow yourself plenty of time - don't cram. This course goes through all the Knowledge Areas plus the Code of Ethics, quizzes you at the end of each chapter, gives you games to play to help you, a recap of everything to review right before the exam plus 5 exams to help you. Now let's analyze what this student just said in testimonial? Student said that you must allow plenty of time and don't cram. This is a very good advice, give your self plenty of time. Another thing that student mentioned is that the course even has games! Wait what games? Yep you heard correctly games to help you reinforce your PMP knowledge skills. Who would have thought that combining learning with games can make process of studying fun? Now the next thing that student mentioned is how realistic questions are and how they closely mimic exam. Student also recommends reading PMBOK before taking this course. But wait how come we didn't mention that in any of our study paths? Well we did mention Ritas book in study path 1, right? We think Rita's book does a great summary of what PMBOK offers, but in addition to listing the processes and other concepts it translates these concepts for an every day person to be able to understand what any of the terminology means. PMBOK is like a bible but without understanding the overall meaning it may not be much of use if only studied from it as the only resource. PMBOK is basically like a bible of PMP community, we also recommend to read this just like student mentioned in their testimonial, in fact according to our company's research we have found that out of 100 PMP test taking participants in the survey, 89% of students used PMBOK when studying for their PMP exam. Hence our recommendation is if you have the money to buy PMBOK then definitely purchase it and study it as the pre-requisite before you proceed with any of the recommended study paths above. Another comment that student made is that PMBOK does not reinforce real life material, but PMP exam does. That is indeed the most truthfull statement ever. Without specialization it's hard to master this exam on your own, assumption for most of PMPs is that they have some level of specialization either in IT security, web development or other tracks. To see what we mean  take a look how our company Tutoring Services, LLC uses project management tactics in real world. Hence it's important to note that this course by Joe Phillips is mostly tailored towards IT level professionals. Some other courses are tailored towards more general practioners. Anyway based on our company's research, and our company is Tutoring Services, LLC in case you are wondering who we are, and perhaps you have already passed your PMP exam and want to earn extra income teaching PMP subjects in your local area or online working as an independent tutor then don't hesitate to visit us here. Our company specializes in researching best PMP study test preparation materials, tutor and student match making, test prep. We review multiple resources on the market and place them together side by side in one place on this very same site that you are looking at, we create polls, blogs, and other methods to obtain information from other PMP test taking students then leverage that information to provide study tips, and other usefull resources for PMP test taking candidates. Project Management area of expertise is not the only area that we specialize in, our roots come from educational and IT consulting background, hence as you continue reading you will see us constantly referencing usefull links and study tips for highly relevant for PMP test taking professionals resources. What is included in this PMP course for students on the budget? Anyway if you read all of our Reviews and Recommendations and want to see what exactly is included in this course, please scroll below or click on more info button. By clicking more info button you will be taken to official sales page of the course where you can view more information about the course, read student testimonials, view how many students enrolled in the course and sign up for the course. Note you can also stick around here and read our PMP certification page to view more info about exam or read reviews about other PMP study resources. The Project Management Professional (PMP)® is the most important industry-recognized certification exam for project managers. You can find PMPs leading projects in nearly every country and, unlike other certifications that focus on a particular geography or domain, the PMP® is truly global. As a PMP, you can work in virtually any industry such as information technology, industrial sector, real estate, medical, with any methodology and in any location. Want dirt cheap PMP books? Go here UsedCollegeBooks.net, compare prices, buy Project Management and PMP books from the cheapest bookstores, Save environment and Save Trees, help earth stay GREEN, cheaper than self guided courses or tutors (but not as good as courses or as tutors, or perhaps... not the same.... in terms of learning effectiviness) Compare prices and select the best PMP books or sell your book directly on college campus. Powered By Tutoring Services, LLC to help you save money on education! However, before you buy book view other PMP Study resources here which are better than books! The PMP also increases your earning potential. PMP certification holders earn 17 percent more than their non-certified peers according to the Project Management Salary Survey. Employers benefit as well. When more than one-third of their project managers are PMP-certified, organizations complete more of their projects on time, on budget and meeting original goals. In this site you will find variety of test prep resources, self guided, online and even local geographical based study methods to prepare for your PMP exam with confidence. Want to study in class or in person? Residing in any of the following areas? CT Hartford, New Haven? View our PMP Certification Study Informatin specifically for Hartford CT students here, we list local class info there. Taking local class often helps when trying to prepare for Project management certification exam especially if it's in front of your face locally. For any other geographical locations in person PMP classes click on banner below, where you will find local class info for many geographical areas or self guided online classes. Who should apply in 2017? If you’re an experienced project manager responsible for all aspects of project delivery, for example IT Manager or Director, leading and directing cross-functional teams, then the PMP is the right choice for you. What Topics are on the PMP exam? If you are preparing for this exam then you better be familiar with the following, percentage items. Major concept of PMP exam that you must understand is Project Management Lifecycle. Here are the areas of concentration that you will have to know when preparing for your exam. (for official topics visit pmi official site) How well do you know these topics? Delivering your project to organization where you work at or attempting to work on the project? Want to impress your Boss or your clients of how professional you can be with your level of PMP expertise in project initiation, planning, execution, monitoring and controlling, or closing? Did you know that you can save tons of time when working on projects by reusing project management templates? Check our Project Management Templates for all life cycles. If you are interested in what type of questions you may find on PMP exam, here are couple sample practice questions to give you idea. What should the change request authorize? Was answering these 2 questions difficult? Do you think you could have answered them without seeing bold answers? Test your PMP skills with access for 90 days to 1000s of PMP practice questions helping you prepare for this industry test. Earning the PMP® Certification involves a lot of time preparation, money, persistance and in many cases professional educational help. It is important to estimate whether your budget and study time allow you to take on PMP exam, as your next professional achievement in your career. By adding up the above items, the minimum PMP Certification cost would be around US$1200 if not more depending on which study path you have chosen.. You may optionally need to purchase PMP practice exams to help you further  or you may want to study in a classroom environment online, or from local/online tutor or from bootcamp. 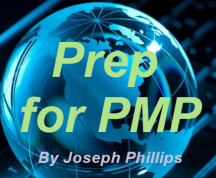 It is often said that the PMP exam is very hard and requires a lot of preparation. The actual length of study usually cannot be determined until you are half way in the study. Luckily, a recent survey of 100 PMP who successfully passed the PMP exam gives us some hints on the amount of time required. This equates to around 180 hours of studies. However don't go by the numbers, go by the following secret formula study tactic. How to study for PMP Exam? If you are in the process of preparing for your exam there are tons of materials to study from, trouble is, there is so many of them! Here is how we can help you prepare for your exam. We have reviewed variety of educational projet management vendors, and made it easy for you to chose from your study materials. Be sure to view for our ratings and highly recommended study materials. We have compiled them togeter with easy to view pricing for you to chose from and compare prices. We provide ratings/reviews/ratings and recommendations for which study guide to chose from. Simply scroll to the bottom of this page if you would like to see different types of study materials or continue reading further. Here are couple of questions you should have in mind when preparing for PMP certification exam. Do you find it is hard to find the time for PMP Bootcamp while you are having a full-time demanding job as a project management professional? Preparing for the PMP Exam is very expensive? People say that the PMP Certification is very difficult and the passing rate is low? Taking a 4 hour exam would be impossible? After spending thousand of hours searching the internet and reading numerous documentations. Getting PMP Certified takes dedication, and studying with the right resources. Think of preparing for your Project Management Professional exam as the way to invest into your future. Employers only pick from the best, having PMP under your belt can solidify your professional standing and increase chances of being hired! To be the best you must study from the best study materials. Continue reading to view other benefits, tips,study guides, reviews, and recommendations for your PMP exam test preparation journey. Are you not satisfied with your current job? Do you want to take a step up the employment ladder looking for better job opportunities? Do you want to earn necessary certifications to make you competitive and outstanding project manager? If your answer to these questions is a big ‘yes’ then do not hesitate or think twice about taking the globally-recognized Project Management Professional or PMP Certification. Why take a PMP Certification? The PMP credential is a widely-recognized and most demanded certification for project managers. This certification can greatly impact salaries and accreditations for many project managers. Having this certification lets you earn higher marketability. What is the best help to ensure successful test results? Here at StudyGuide.net, we offer the best PMP Primer study guide that has been proven effective. The best PMP test writers and publishers came up with the most efficient printed study guide to gear you up to become one of the successful project managers in the industry. Already passed your PMP Certification exam? Preparing for a project? Trying to find templates to save time on project proposal? As the project manager you may at some point will need to start using templates to do project proposals, initiation, execution and closure all 4 lifecycles. Feel Free to check them out, in fact if you end up purchasing entire template kit, it comes with FREE Project management study guide, visit our templates page fore more details. Go ahead and grab a copy of the PMP study guide for yourself and start preparing for the important test of your managerial career. Check out the available study guides and other test preparation resources in our online library and pick out which best suits your preferences. Buy now! Chose from collection of different types of study guides, ranging from flash cards exam secrets, and PMI Training institute study help materials in the form of live classes, practice exams, online or local tutors and more. Compare prices, view test prep materials info. Simplilearn doesn't offer Pass Exam Gurantee in comparision to the next training provider shown below. We give this provider high rating, due to the fact that they have loads of content for future project managers, and offer different study methods for students to study from. Either, based on your own schedule, on demand, or live. Tutoring Services, LLC is all about helping project management students chose their best Training Center. We have created a website specifically for school, training center, professor, teacher ratings. Before picking your project management training center read ratings and reviews of other students who attended the training center! Visit site below to view top rated training centers. There are many global training centers available around different countries, who can teach PMP courses locally. Tutoring Services, LLC is all about helping students chose the right learning path for their PMP studies. Note Learning/Training PMP Center in many cases may simply not be affordable enough or simply not the right choice for some students who are preparing for project management certification PMP exam, hence in many cases it's more affordable to just get a local/online tutor to help you directly in your home or online and tutor you for PMP exam and help you prepare for your exam. Buy/Sell Project Management Used College Texbooks directly from each other on Campus! Tutoring Services, LLC does not stop here in helping project managements improve their chances for passing their PMP exam. For students who already have used project management textbook or looking to buy PMP book directly from another student in School or online for the cheapest price,then don't hesitate to visit our sister site UsedCollegeBooks.NET Project Management section. You can list your textbook in your school FREE of charge, then simply meet with student face to face on college campus, or you can buy book directly from another student! No middle man fees applied! Plus by buying Project Management Texbook directly from other student, you are helping environment Stay GREEN by reusing old PMP textbooks and not waisting paper. Tutoring Services, LLC is all about helping Environment Stay GREEN. Alternatively to buying books Directly you can search for them online across multiple book vendors! Alternatively you can review chapest PMP book prices available on the market from different online bookstores and buy the cheapest PMP book for your Project Management test preparation studies. The only downside with many of the books that you find from multiple vendors on that site is that many of these books have outdated PMP questions and no review information, hence if you want to increase your chances of passing your project management professional exam, be sure to scroll down below to view our recommended study guides for PMP and read our reviews to see what we think about them. Looking for Project Management Tutor to help you prepare for exam? Search for multiple types of PMP tutors, local or online. Many sites charge money to register as a professional tutor and charge tutors money or collect middle man agency recurring fees for every hour project manager trainer tutors, thereby creating tutoring fee very expensive for student. To combat this non-sense our company Tutoring Services, LLC helps project manager trainers register without having to pay any comission fee on our www.TutoringServices.com site FREE no agency recurring fees. Ever wondered what would be awesome combination for your career? CISSP and PMP combined.... this is a killer combination for anyone who is in information security field and happen to be certified in both tests. Find out more visit CISSP study guides section for more info. Looking for tutoring job as project management? Trying to become project management tutor to earn extra income on part time basis? Residing in CT, NY or NJ? Apply with Tutoring Services, LLC to be advertised on our loal tutoring network of websites. (opportunity limited to Bergen County NJ, Westchetser County NY, Fairfield County CT and New Haven County tutors). Want to continue browsing more for variety types of study guides? We did all the hardwork and put them together for you, to choose the best one. Be sure to select filter to show more then 10 study guides below to see what resources are best for you. PMP Exam Secrets helps you ace the Project Management Professional Exam without weeks and months of endless studying. Our comprehensive PMP Exam Secrets study guide is written by our exam experts, who painstakingly researched every topic and concept that you need to know to ace your test. For better results consider studying with both flash cards and exam secrets. Combine studying from multiple study resources with the local or online PMP Test Prep Tutor for the best results. Continue reading to see which other resources. Early in Your PMP Certification Path, You may encounter the following questions. Do you find it is hard to find the time for PMP Bootcamp while you are having a full-time demanding job as IT Director or Project Management? 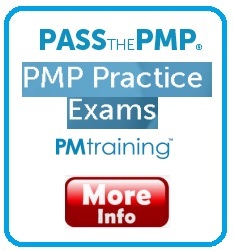 People say that the PMP Certification Exam is difficult and the passing rate is low? Taking a 4 hour exam would be non-realistic or impossible? We did all the hard work for you and found the best PMP Learning Resource on the market. After spending tons of hours researching the internet and reading numerous PMP blog sites, fortunately Tutoring Services, LLC have found solution to the questions listed above. Getting Certified for PMP EXAM does not have to be hard. Take a look at the Project Management Practice Questions study material shown below. It can help you solidify your chances of passing your PMP certification exam. Continue reading further to see how and why. Are You Prepared for your PMP Test, why not study with access to practice questions? If you have asked your self questions above or ever wondered of how to study for your PMP exam efficiently, then you may want to check out how you can study for your exam by practicing answering project management questions and seeing how well you do on the simulated PMP Test. Why use this resource to prepare for your exam? New! Easily create your own PMP tests from our database of 1,000+ questions. 90-day access to professional PMP practice exams for only $59.00. We realize it can be tough to prepare for your project management exam especially when there are so many options to study from. Here is what Tutoring Services, LLC thinks about this PMP practice exam set in comparison to other PMP Project Management study guides on the market. This particular practice exam set has tons of methods for students to obtain necessary skill set in effort to pass their exam, but is not recommended to be the only source of your PMP studies. The practice exam set of PMP questions has a very reputable vendor who is updating exam questions content consistently, ensuring that you do not end up with questions that are outdated or not relevant to the latest PMBok Guidelines. Do not ever purchase any study guide materials from vendor who does not update their exam questions based on the lates PMBok guidelines. Always check to ensure that practice exams allow you to create your own PMP questions, so you can drill your knowledge skill by creating set of multiple quesions per each exam and testing your self to see if you are improving. Now let's talk about Price and Affordability. Reason why we give 5 stars to this practice exam set is because it's not only just the exam practice set it's the ultimate test prepartion machine for your Project Managmenet Journey! Sure you will find tons of other study materials out there which we also list on this site and also may find helpful. But in some cases other companies will charge $20, however that $20 course may end up leading you in the wrong direction and end up causing you to FAIL your PMP certification exam especially if the study course vendor content is not updated. How much will it cost you studying the wrong way? Well let's do the math Exam cost approximiately $500, time spend reading useless questions that are not even covering latest topics will set you back another 35 to 100 hours. Is failing due to poorly written $20 practice set questions worth waisting $500? Probably not. That is not to say that all of the $20 PMP practice exam courses or practice sets are like that. The reason why we know all of this is because we are educational research company Tutoring Services, LLC. We specifically research best study material that can be leveraged by students when preparing for their exams. We research Academic subjects and Professional exams, then we lay it all out in front of students to see. We explain to students that there are high PMP quality products and low quality, low quality are typically cheap products. We also know that, is because we create products from scratch (not this partiuclar PMP product but other products in academic sector) and also happen to be in Test Prep, Research and Tutoring field and fully understand the ultimate truth behind student's PMP test taking needs. Plus we actually hire PMP tutors ourselves in CT, NY and NJ area (specific counties), and have entire company DBA Binary Fusion that is ran under our umbrella focusing on nothing but Information Technology/Web Development/Project Management services (if you would like to be our intern don't hesitate to apply for more info visit here, note only limited spots available USA Only in CT, NY and NJ). Hence we can confidently recommend to students PMP product that we think is good. We are not some blog enthusiasts, with scheme to produce the best PMP blog in the world and lure you into purchasing their product while begging their students to buy products through their links, in fact we been non profit since 2008 for our Tutoring site that still up to this day does not charge any agency comission fees, making us the only educational company truly FREE, who provides Tutors opportunity to make money without chargine agency recurring comission fees. In fact we invite you our fellow Project Management students once you pass your PMP exam to register on our site FREE of charge to earn money tutoring students PMP Exam or other subjects without having to pay any tutoring agency comission fees and earning money on part time basis (offer available only for USA residents). We provide independent evaluation of what we think about this PMP Practice exam product. Our goal is to simply inform you what your learning options are and recommend you what we think is best for your project management test preparation Journey and help you make decision on your own. The practice exam set from PM Training that you described on this page is your ideal test preparation study material for your PMP test. We also have project management instructors who we directly communicate with, who happen to work on Wall Street in NYC providing PMP Training for College students. We can recommend students PMP training experts who can literally work with students side by side online and prepare you for Black Belt Sigma, PMP, PMO, SQL or any other exams online over our propriatory whiteboard. Or if you live in NY Manhattan, CT, or NJ area locally meet you face to face to provide in home PMP tutoring or in local starbucks or online. In fact we even develop our own Whiteboard Solutions helping students learn math online, and leverage that for other subjects such as PMP Test preparation, meaning you don't get charged arm and the leg when preparing for your exam online. How would you like to be trained on weekend online by PMP Trainer one on one? If you prefer that option we can recommend the right person for that, simply shoot us an email by leaving a comment. This option would be perfect in combination with the PMP practice exam set purchased here. However it's a bit expensive, hence is the reason why we don't recommend our PMP experts provided directly by Tutoring Services, LLC to you unless of course you are located in CT, NY or NJ region and ready to pay up for our high quality PMP expert Ninjas or if you want someone online and still ready to pay up but slightly less then local tutor. Why do we say that upfront like that, reason is simply because we provide quality PMP experts, just like similarly we provide Math Calculus experts and provide you real expert who really can help you pass your exam. Why it's a good idea to have consitency when studying for your exam? Another reason why don't recommend our PMP tutors provided directly by our company is simply because when studying for PMP exam it make sense to have single company provide both PMP trainers, study materials practice tests and higher level of assurance that you end up passing your exam rather then getting tutor from one vendor, getting practice test from another vendor, and getting course from the 3rd vendor. This can cause students stress and inconsistency in their learning process and create learning gaps when preparing for their PMP exam. Students prefer consistency and single vendor to work with and not having to jump across different vendors providing different things and getting confused. Hence for that reason if you do prefer to get online tutor and practice exam and bootcamp content by single vendor then click here. The truth every PMP student should know is if study vendor doesn't charge enough for practice exam sets, that means the product was not properly created. Meaning not enough time was spent, not enough research was spent in creating it based on latest PMBok objectives. Many companies you see simply create PMP Exams Practice courses with questions, but their quality is horrendous. These companies you must watch out for. To give you an example of how our company Tutoring Services, LLC helps students find proper study resources in PMP prepartion journey take a look at this comparison of how we help students Academic world prepare for Calculus subject. Sometimes we get students who contact our company Tutoring Services, LLC and ask us, well why are your Calculus tutors so expensive, and here is our response that we give to Parents. (take a look to see what we mean) After reading this response students instead of purchasing cheap tutors, prefer to purchase expensive ones? Why is that the case? The reason why is simple students prefer quality, the same story goes here. When preparing for PMP exam it's important to study from reputable vendor with high quality content. We believe the PMP Practice Set exam set has high quality content. How does it compare to other vendors in terms of affordability? Here is what other test taker companies missing out there that can definitely help you prepare for this test. Ability to create your own questions and practice from randomly selected set of questions to reinforce your skill sets. This particular vendor has slick way for you to create your own questions out of 1000+ questions database, letting your create your own PMP tests to reinforce your skill level and knowledge. So although other tests can be affordable and even cheaper then the price of this particular exam set, many other vendors who offer similar exams simply lack that level of flexibility. Plus many other vendors do not really provide you access to 90 days, this vendor provides access to your exam for 90 days, this should be more then enough time for you to prepare for your exam, in case if it's not enough time for you to prepare for your academic exam then you may want to consider getting private PMP instructor to help you prepare for it, we list several options for private instructors access listed below (as you continue reading). In fact if you already looking at considering purchasing this PMP practice exam and not entirely sure if it's enough and really want to take it up a notch to ensure that you end up passing your Project Managment Professional exam, then there are PMP online class offered by the same vendor with real live instructor, that already includes access to this pmp practice exam set as part of your PMP training. Note PMP Bootcamp also has everything listed in this page, + more. 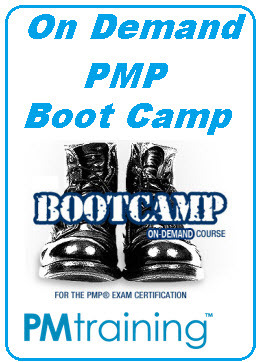 For PMP BootCamp info click here. We think this Practice Tests by PM Training can be great study resource, but in reality it may not be fully enough to study from just the practice exams, unless of course you solidify or reinforce your skill set with formulas, mind maps, printed materials and other types of study guides neatly offered in PM Training BootCamp. What is offered in the bootcam  can solidify your understanding of Real PMP exam and go far beyond practice tests describehere. Plus bootcam is also part of the same PM Training Vendor, making it more intuitive for you to study from since overall look and feel is similar in many instances when studying for the exam, reviewing formulas, reading mind maps, checking our the practice questions and more. Hence if you really can spend a bit more on bootcamp and kill 2 birds with one stone getting both access to practice tests and getting tons of other project management study content that you would not get otherwise, then we strongly recommend you to check out bootcamp pmp prep study option. Although sometimes it may simply be best to study with multiple resources. If you are on the budget then you may want to consider more cheaper PMP study guides, such as exam secrets and flash cards with combination of access to the practice tests described here (we would not recommend purchasing exam secrets and flash cards on your own, we do not think it's enough to prepare for this test with just flash cards and exam secrets. However exam secrets and flash cards study guides can be good especially in the beginning stage, but tend to be too general in content and not too specific, you have to watch out for that especially with new exam format changes, it's very important to go with the vendor that is on top of it all. Sure there are other courses also available by oher vendors that are great, but they simply lack overall amount of content that is really needed in order to prepare for this test efficiently. When purchasing access to these practice tests consider not the price, but the fact that you can reinforce your skill set by creatings tons of practice questions, and the fact that there are tons of PMP exam tips, video tutorials and personalized reports that can help you prepare for this exam efficiently. Other vendors simply lack that level of content depth. Note if you do not feel that 90 days is not enough for you, then start your journey by studying from exam secrets and flash cards, then once you get some level of understanding purchase access for 90 days to this exam. It will be cheaper then buying access to bootcamp, but effectivelywill deliver at least 75% chance of passing your exam. Reason why we say 75% is that because, even if you were to purchase exam secrets, flash cards and PM training access for 90 days to PMP practice questions, it still not as good as the bootcamp. To increase your chances above 75% percent of passing consider the following pre-requisite. Purchasing access to bootcamp or PMP practice Exams with quest is something that you do not want to jump into either unless you have some sort of project management foundation and ready for it, since bootcamp does require extensive training, and practice exams with questions that you don't understand won't mean much, so having some level of project management foundation is essential here. There are several cheaper versions of video course tutorials for PMP exam, that can be great way for you to get into, and will not put too much stress on you as much as bootcamp would do and can be great learning foundation for you. We recommend you review our other vendor who we listed here, who offers video courses. You can start learning 4 cycles of project management, initiation, execution, planning and closure then reinforce your knowledge with other exercises that SimpliLearn the vendor offers. This vendor is not as good as PM Training Vendor, but does have some great level of initial learning foundation and can be leveraged as the stepping stone, when preparing for your PMP eaxm. If you have already had some training in PMP and for example took a course before in college or your training school, and already do have some understandign about PMP exam, and what it covers, or simply already took this test but failed, simply because you were studying from the wrong resource, and simply want to improve your chances of passing, then do consider purchasing access to this particular 90 days access to practice tests, or our highly recommended option to PMP self guided bootcamp. Prepare for Project Management Exam with the help of flash cards, study material includes practice questions. You can succeed on the PMP exam and become a credentialed Project Management Professional (PMP) by learning critical concepts on the test so that you are prepared for as many questions as possible. Uses repetitive methods of study to teach you how to break apart and quickly solve difficult test questions on the Project Management Professional Exam. Study after study has shown that spaced repetition is the most effective form of learning, and nothing beats flashcards when it comes to making repetitive learning fun and fast. Read more by scrolling below to see what's included or click Buy now link for more info. Our flashcards enable you to study small, digestible bits of information that are easy to learn and give you exposure to the different question types and concepts. PMP Exam Flashcard ..
[title] => PMP Training Bootcamp on Demand! The following course is on demand PMP course which is a comprehensive review, helping students prepare for the critical PMP exam. By purchasing this exam you would have access to intensive course lessons. With intercombination of 65 high quality lessons and 35 pmi contact hours, bootcamp is designed to provide all of the information you will ever need to pass your exam. Why is this course great resource to prepare for your PMP Exam? Keep in mind that this course is self paced, if you are looking to solidify your chances of passing your PMP certification exam and getting the job of a project manager or enhancing your existing specialization, then we recommend studying from multiple courses not just this one. What PMP course is even better then this one? Great course that we think is perfect for students is the live version of this course, live version is very similar to self guided on deman course (the one described here), however it's ran by live instructor in real time. There is als 100% Pass Gurantee, when enrolling in their live class. If you do not like studying on your own and prefer to study with the help of PMP instructor live online then click this link. However if you have no time for Live course or the budget, then this self guided course is for you, it's moderately affordable. Plus think of it as investment rather then money spending when purchasing it for reasons why we think passing PMP exam is investment continue reading further. Formulas, Memorization charts, study tips, process maps, tons of exercises, references etc, if you were to buy it all seperatelyt his would be way more then the price of this course you see here. Reason 3. Studying for this course helps you with PMI accrediation, many other courses you see online don't have that. Without accrediation you are less likely to get the job as the project manager. Reason 4. This on demand boot camp can be taken based on your schedule. You don't have to wait for anyone. Reason 5. If you pass this course you can also make money tutoring students online or locally on part time bases as an independent tutor, exclusive opportunity provided to project managers by Tutoring Services, LLC for more info visit here. We gave you plenty of reasons to consider purchasing this course and using it to obtain knowledge you need for passing your project management pmp exam. How Does Tutoring Services, LLC Rates this course? About our rating:  We reviewed multiple courses, in fact we also hire local project managers and instructors working for us in the area of CT NY and NJ, and also giving opportunities for project managers to make money outside of these states throuh our sister site www.TutoringServices.com We also have a business called DBA Binary Fusion, that specifically focuses in IT Managed Services. We specialize in Information technology sector, that specialization requires very strict knowledge of project management. We have project managers in our team and experts who work with us teaching students and completing projects. Feel free to check out how we use project management expertise in real world. We specifically searched for multiple courses online to see which project management material is the best one and how our company can help future project managers pass PMP exam. We reviewed multiple study materials. Then we found this PMP bootcamp course and here is how we rate it. We give this course solid 4 star ratings. There are other courses also from Simplilearn that we reviewed and we think that they are also good for PMP prep who we also gave 4 stars. However this self guided course, we believe has the higest learning effectiviness, based on the amount of materials included as part of the inclusive price. In this self guided bootcamp you simply get more for your money, then in any other study guides we seen. From the perspectify of quality this course is very similar to others that we provided review of, however from the perspective of quantity of study items you get, this training supercedes by far any other type of PMP training available. What's included in this BootCamp? Here is what's included in this course, basic princpals and framework, including scope, time, integration management. Over 35 hours of interactive lessons on Demand! Credits Earned Recognition! with Pre-approval for 35 PMI Contact hours! PMP Exam Prep Course Manual, with Study Tips! This on demand course also cover cost, quality, and HR management. Course Milestons 10-12 cover procurement, stakeholder mangagement as well as professional and social responsibility, cousre summary and certificate. Interested in Purchasing this Course? What other courses does this Test Prep vendor offers? In case if you happen to be into Cyber Security field, the field that is rapidly exploding in the near future, then you may want to check CISSP exam. Passing this exam in combination with PMP providers a killer combination for your career. This is where you can online training for CISSP exam. Did you know you can save time and money when working projects with Project Management templates? Note if you really want to solidify your undestanding of PMP exam, we also have variety set of Project Management Templates, that can help you save time and money when proposing project scopes to clients, executing, intiating or closing project. Check out variety of project management  templates here. How soon will you become project manager? When you become one would you be interested to make part time income? If so visit our project management jobs employment site to see if you can help out teaching students PMP, AGILE, SCRUM, ITIL, courses locally or online, Tutoring Services, LLC is hiring locally in CT, NY and NJ, if you outside of these states then you can become indepndent contractor working as your own BOSS by registering your Project Management expert profile absolutely FREE. If interested in jobs opportunities for project managers teaching other students for PMP, AGILE, SCRUM, SIGMA preparation or other subjects visit us here. Hence passing pmp exam and spending money on training material can be investment not only for your career but investment into being able to make part time helping students prepare for project management exam. Let this be your motivator when preparing for your exam. Have only couple of weeks left before your alredy scheduled PMP exam? Freaking out? Gain more confidence by booking your self tutoring discount package from one of the local or online PMP tutors to boost your chances of passing your Project management test. Getting at least 10 hours of PMP tutoring couple of weeks before your exam is highly recommended. Getting 1 on 1 tutor will provide you with the highest level of project management learning effectiviness. We realized that not every person who is preparing for PMP needs a tutor, but many folks fail PMP simply because they were not well prepared. Getting 1 on 1 tutor is a sweet deal for any exam candidate who is seeking in gaining warm and fuzzy feeling in their test preparation journey and increasing their chances of passing PMP exam. The problem is, PMP tutors are simply way too expensive to be hired for 1 on 1 training. Which is precisely the reason why if you do no have money to pay for 1 on 1 PMP tutor your self, then one recommendation I can make is to simply get your company to pay for your 1 on 1 training and include this as part of your overall PMP test preparation costs. Tutoring Services, LLC is the company that provides 1 on 1 PMP tutors for companies and students. If your company happens to agree to pay for your project management training (and most companie do have yearly training budget) , then one way to get certified for PMP is to use the following 4 step study tractic. Using the 4 steps above you simply can not fail, and if you do, then feel free to buy more tutoring discount packages. Rome Wells PMP Study Tip for students on the budget who still want quality project management training in real time. Want to go beyond Bootcamp? Looking for live PMP online class? Have you considered checking online live class by Edureka? The PMP online course by Edureka is structuraly schedule based, meaning you must check the schedule when the course is being taken. Hence it's slightly different from PM training boot camp. 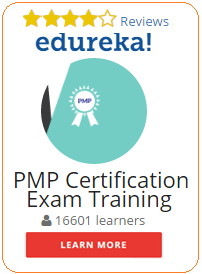 Click on the banner below to learn more about Edureka PMP Online course. Our Live Virtual PMP classes are taught by expert instructors, who also bring their real-world and relevant experience to the students. Now offering evening and weekend classes! Did you know that studying for PMP exam increases your chances in obtaining a job in the company, Project management is one of the major key qualities employers looking for in the candidated. For example take a look how real companies use their Project Management expertise in real world for delivering high quality solutions to businesses. Why it's important to be more then just Project Manager but also have specialization? If you are studying for this exam and thinking that PMP is the only exam you will need to get project manager job, then think again, majority of employers looking for specialized types of project managers, for example if you wanted to become IT Project Manager then you must have some level of expertise in network architecture, design and security, or be expert in SQL databases, you must have some sort of specialization. Having PMP exam passed and obtaining PMP certification  is something that will definitely differentiate you from other candidates, who are coming out straight out of college with Bachelors degree in computer science or other relevant fields. However do not place all your best just on passing PMP exam and expecting a job, real world requires real experts, specialization is the key. What is covered on PMP prep course? Other relevant exams to consider studying for. Other exams you may want to consider preparing for to increase your employment qualifications are AGILE, SCRUM, and if you really have what it takes to become super IT Hero, Black Belt Sigma. How to Prepare for Project Management exam? Step 1. Review which Method is best for you, note we list multiple study guide options for PMP, PMI Training has self guided courses, online live class and practice tests, depending on which stage of the training you are at, it may make sense to buy one study guide as oppose to another. Step 2. Review what is included in each study method. Step 3. Purchase Your Study Resource. Want to see an alternative to PM Training? Have you considered getting online or local Project Management tutor to help you prepare for exam and pass your PMP test? Do you think  1 on 1 tutor is too expensive for you? then solidify your study with either PM Training at your own pace or reinforce your knowledge with Flash cards and exam secrets. 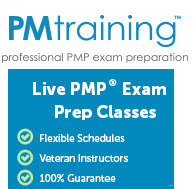 Consider checking PMP live course below (shown in this banner below... remember make sure you check the date when the course is being offered) . Project Management Kit Great Resource! Great Way to Be Professional and show your Project Expertise Skill Set with Templates! We offer the following types of templates. If you are currently studying for PMP exam or in the process of trying to land a job as a manager, or simply happen to be existing manager in a company who needs to complete a project, but have no clue where to start. Then we got the solution for you! Organize your Project with the templates. The good part about these templates is that they also include FREE Project Management Study Guide! If you purchase entire kit! This is great, especially if you are in the process of preparing for your PMP exam. If you are, we recommend that you review our variety types of study guides that we listed from the link above..
Templates can help Project Managers get organized! Templates can help IT Directors, Project Managers and other types of individuals organize information for their project, or help students with interview questions preparation as the project manager. Templates also help people present project professionally and help reinforce  knowldge for the upcoming project management ceritification exam..
With combination of FREE project management Study Guide that you will get by purchasing this template KIT, you can improve your chances of passing your PMP exam! Plus have valuable templates that can help you get your projects completed, killing multiple birds with one stone! Obviously studying just from that exam is not going to cut it for you to pass, we definitely recommend for you to review other resources as well if you are preparing for your project management certification. Anyway back to templates. Why We recommend these templates and how we use them in real world? Tutoring Services, LLC recommends these Project Management templates for delivering projects. We suggest trying them out. Use them to deliver your project from start to finish, and by using these templates you can save time on projects, improve your chances of passing your project management exam, download them today. In Fact our company uses these templates to deliver our own real life projects for our IT Managed Services based Network Consulting company! Check out our service page here to see how we use project management in real world. When it comes to delivering scope or dealing with customers, we rarely ever reinvent the wheel. Especially in IT industry, it's hard to keep up with every type of customer request, however to look professional, it matters to deliver projects properly and present them in the right way. For our DBA Binary Fusion company, operated under Tutoring Services, LLC umbrella we do just that, use these templates when delivering IT projects. In fact we even hire IT Project managers who are located in CT and NY and NJ view our tutoring jobs page for more info. When it comes to working on the project, it matters how you approach the project which way, what is the proposal what is the scope like, many different elements matter. Project Intiation template would be the best type of resource you can use to lift off the project. Project Proposal, Business Case, Feasibility Study, Project Charter, Job Description, Project Office Checklist, Phase Review Form initiation. To Look professional you may want to consider purchasing initiation project templates. Initiation stage is the most important phase, if done wrong companies can lose customers. We use initation templates for our DBA Binary Fusion company to propose Network Deployment Scopes, Network Refresh and other types of projects, all of that gets initiated with the project intiation template. The question is will you be covering each one of these planning topics without templates, from scratch? If so, this can take a lot of time, we suggest using Planning templates to save you a lot of time. You can buy them seperately if you do not want to purchase entire Kit. When we execute our project at DBA Binary Fusion we follow the following principals, for example if we were to execute web development or Network deployment project, we would always cosider the following qualities and factors. Time Management Process, timesheet form/register, cost management process, expense form/register, quality management process, quality review form, deliverables register, change managment process, change request form, Risk management process, risk form/register, issue managment process, issue form/register, procurement management process, purchase order form, accepntance management process, acceptance form/register, communication management process, project status report, communication register,phase review execution. By using execution templates you can save time and organize your self in making sure your  projected is presented professionally. You can buy Project execution templates seperately for any of the mentioned factos listed above. How long the project takes, how many resources are going to be allocated for each project/task, how well task was completed, how good of the quality of completed task, was the project delivered? Was it done within the change management/ and change control organization process? Was the Risk management done properly? Was the purchase order form issued for specific project? Was it accepted? How is it all being tracked, what is the communication process flow like? What's the project status? Don't like the price for templates? Buy Seperately! You can also Buy each indvidual template seperately for lower price, depending on what you need prices range from as low as $5 to $10  Click Buy Now Button link for more details! kit includes all of the templates you need for projects. More than 50 templates, plans and forms are included, covering the entire Project Life Cycle. It helps you to start up, plan and execute projects quickly and easily. You can download this kit immediately, then open each template in Microsoft Word and fill-in the gaps to create your own documents. It's that easy. Buy now and get the Project Management Guide Book for free. This kit includes all of the templates available on our website, saving you $136 off the individual purchase price. The following project management templates are included. PMP Training Bootcamp on Demand! Study Guide Type: PMP Training Bootcamp on Demand!